Despite disappointing with it's lack of cast diversity, Mayflower's Oz-themed odyssey is wicked-good. There’s a reason Wicked is currently the 6th longest running show in Broadway history: its exploration of corruption, nature of evil and the diplomacy of silence stands the test of time. Wicked is based on a novel written by Gregory Maguire, who sought to reveal moral dilemmas within characters’ backstories, choices and intentions, fantastically expressed in a land with flying monkeys and shy lions. The biggest question coming out of the novel was ‘was Elphaba really wicked?’. How does this question translate to the modern day? The nature/nurture debate of who and what makes people do evil things is something still explored and unanswered today. It’s no secret that the show also translates a movement dedicated to giving a voice to the oppressed, namely people of colour, animals and those willing to shout. Anyone who feels they have been subjugated by society can instantly relate to this story. The Oz ‘government’, or leadership, oppresses the Munchkins and literally takes voices away from the animals, using them as, what Dr. Dillamond notes, a scapegoat (sound familiar, Brexit?). The musical numbers highlight the lethality of silence, as well as the possible corruption of good people. Galinda is a sort of Machiavelli in this story, loved through charisma and intention, and powerful through lies. The play’s exploration of this is the reason Wicked has been so popular, evoking the same passion we see with musicals such as Hamilton, Hairspray and even Matilda. Having seen the show a few years before, back when it starred Idina Menzel as Elphaba and Kristen Chenoweth as Galinda, I was interested to see how the actresses in this tour would portray these beloved stars of the show. Helen Woolf (Galinda) offered an excitingly comical version of Glinda/Galinda, the lovable popular ditz, whilst retaining her charismatic intellect as a leader and strength as a friend to Elphaba (Amy Ross). Elphaba’s character was most interesting for me, as, during the song ‘No Good Deed’, where her lover, Fiyero, was taken away to be killed for protecting her, she vowed she would never do a good deed again. Elphaba presents the confusion of human nature, the need for security, safety and love in whatever its form, as well as the craving for freedom, control and self-empowerment. However, Act One concluded with the most famous song, ‘Defying Gravity’, only to be followed with Elphaba commenting that she is now ‘limited’ and staging her own murder to give up being that voice amongst the silence. Echos of the strength Fanny Brice in Funny Girl blasted out in ‘I’m the Greatest Star’ ran through my head, remembering she also ended it with ‘My Man’. Even Hairspray, as mentioned above, ended with the protagonist getting the guy (not to mention, many are heterosexual and usually white-dominated). So, why is it that so many powerful musicals finish like this, yet are still translating to people, young and old, today? The feminist in me wants to shout at that, to scream ‘why is that always the happy ending? !’, to shake these women and tell them to continue fighting for what they believe in, whether that be to be a comedienne, or to end tyranny in the land of Oz! Despite all of this, Amy Ross’s performance of ‘Defying Gravity’ was truly breathtaking. Idina Menzel, as much as I love you (especially on Glee! ), step aside, because a new star has come forward. Ross’s expression of the confusion of human nature genuinely made me feel both for and against her at times, truly being both wicked and ‘beautifully tragic’. Mark Shenton comments that Wicked is ‘a musical about change and experiences, and audiences identify with it even as they’re being told a great story’. Wicked talks about the human civic duty as well as their permissibilities as people in a way that is accessible and educational to those who don’t realise they’re getting the education they need. However, there is still a long way to go. As Malala Yousazfi once said, ‘when the whole world is silent, even one voice becomes powerful’. If you have the chance to go and see it, whether you’re a musical nerd or just curious, bring tissues, because the big songs will get to you. 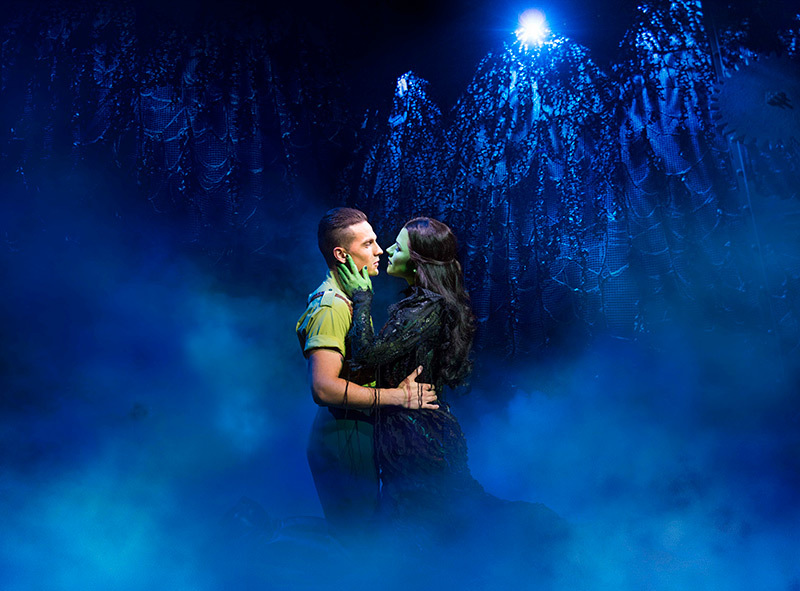 Wicked is running at the Mayflower Theatre, Southampton, until the 27th October.